Polina was born in Ryazan, in 1988. When she was four, she started her music education at children’s music school No.5 (class of Vladimir Bobylev). In 2007, Polina finished the Chopin Moscow State College of Music Performance (class of Professor Ara Bogdanyan, the Honored Art Worker). In 2012 graduated from the Tchaikovsky Moscow State Conservatory (class of the same teacher), in 2014 graduated from the post-graduate studies. Since 2015 is an assistant lecturer of the Moscow Conservatory in class of Ara Bogdanyan (violin division chaired by Honoured artist of Russia, Professor Sergey Kravchenko). In 2012, Gran Prix and Shostakovich special award at the 1st International Competition n.a. Savely Orlov (Samara). In 2013, winner of the Moscow International Competition and Festival of Slavic Music. In 2014, winner of the 8th "World Muses" International Competition (Moscow), the International Competition and Festival dedicated to the 100th birth anniversary of Hrachya Bogdanyan (Armenia). In 2016, winner of 1st Prize of I International competition Agustin Aponte (Tenerife, Spain). 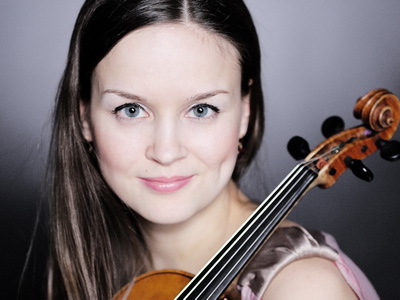 Polina is a fellow of “New Names" and Vladimir Spivakov Foundations, a fellow of the Ministry of Culture of Russia (1999-2000), honored with the D.Shostakovich Award, the Moscow Government Award (2014). She took part in the Moscow festivals: “Romantic Music of Young Musicians”, “Renaissance” International Music Festival of Youth, “Primavera Classica” International Music Festival, "Grata Novitas", "Steps in the snow", as well as in the International Festival of Chamber Music "32 Semana de la musica camara” and Musical Festival "Noches San-Mateo" in Spain, Festivals "Kremlin evenings" (Ryazan), "White Nights of Karelia" (Petrozavodsk), etc. Since 2000, Polina has been annually invited to Montreux and Real (Spain) to participate in the International Festival and Courses of Conducting and Professional Skills Improving. The geography of performances includes the cities of Russia, Europe, Asia and Africa. In 2009 the International musical duet "Polina Borisova & David Almerich" was created together with the Spanish pianist and saxophonist David Almerich, in 2012 the solo CD "From Baroque to Jazz" by Polina Borisova with the participation of the Spanish pianist was recorded. Polina participates in the programs of the Saint-Petersburg Music House since 2013.